My day started earlier than normal as I was having difficulty sleeping. 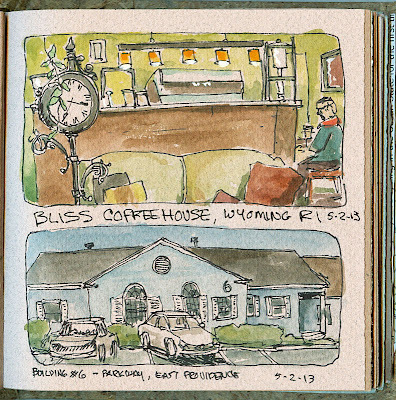 I headed down to Wyoming about a half an hour earlier than I normally do with the plan on getting a coffee at the newly found 'Bliss Coffeehouse' which is only about a half mile from work. They serve great coffee and the folks there are great and are always playing a good selection on Pandora. 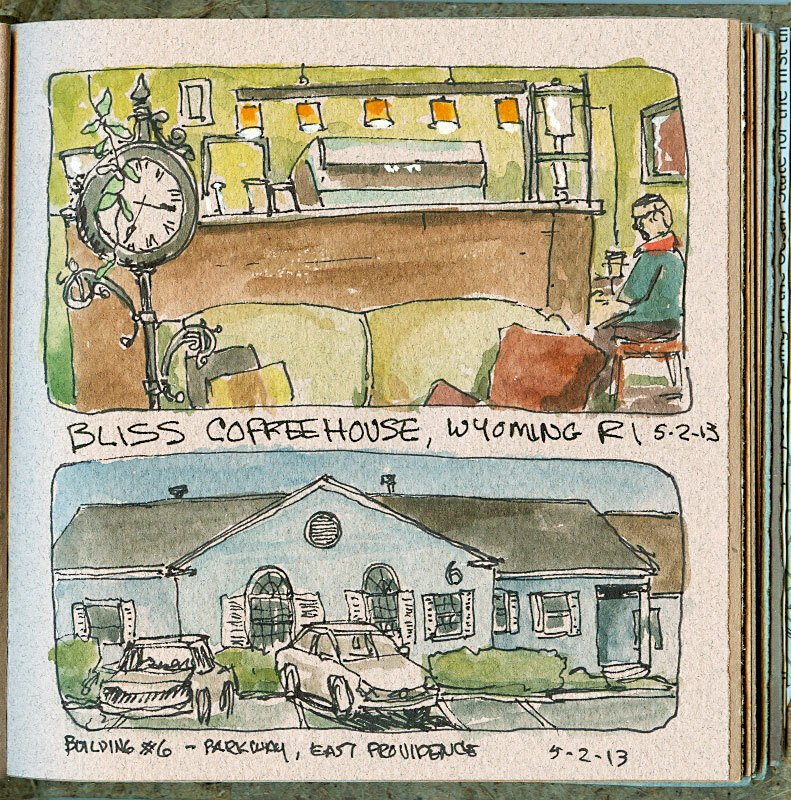 The upper little drawing is the inside of the coffeehouse and doesn't do it justice as is is a very comfortable and cozy spot. This afternoon I had my annual checkup with my Doctor and all is well. I got there about 10 minutes and kicked out the little sketch on the bottom of the page. I also got off the highway and drove down Allen's Ave as I have been watching the demolition of an old 1940's fishing boat in the scrap yard. I stopped and chatted with the guard and had to shoot through the fence. 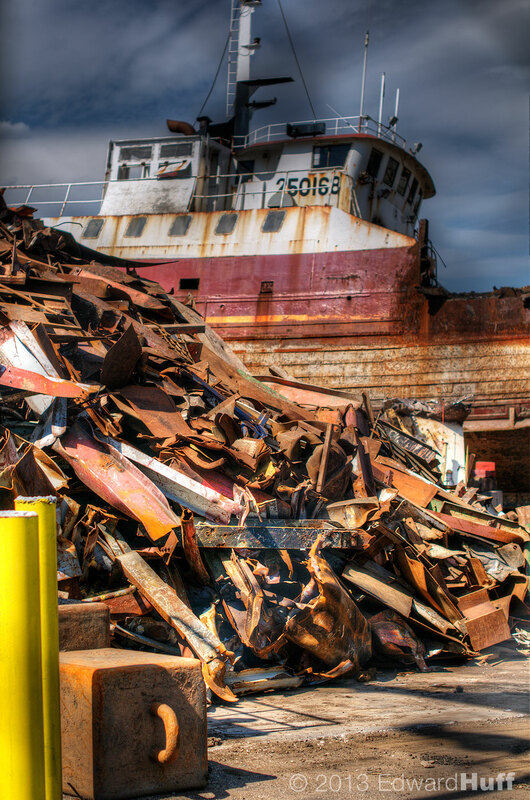 The picture below is a 3 exposure HDR shot which I think speaks volumes about how everything comes to the end of its usefulness. After my Doctors appointment I drove down to the boat which was hauled yesterday for some repairs to find her filling with water fast. I probably had over 500 gallons in the hold and had I not gotten down there when I did, she would have gone down for sure. 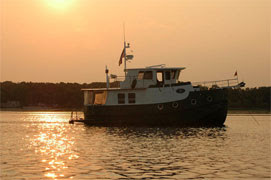 The marina had installed a thru-hull transducer which they had damaged when they hauled her out for the winter. We had a minor leak from that - about 6 gallons a day. Now it is was coming in at about 300 gallons an hour. I know the rate because the marina told me that they had checked it at 4:00 and she was dry -- I got there at 5:00 to find the hold full. As soon as I arrived I started bailing with a 3 gallon bucket and was barely able to keep up with the flow. I suspect that they did not let the caulking dry and it blew out. After a few phone calls I got some help down to the boat. We installed 2 pumps to keep her afloat through the night and I am meeting the crew at the marina at 5:00 AM tomorrow to haul her out once again. Let's hope they don't have a power failure. . .or she may be on the heap. Yikes!